I've never really been a huge Record Store Day person. I love the concept, but lately it seems like you have to get there the second the store opens and hope they happen to have the ultra rare 7" of some 20 year songs you already have in three other formats. It might seem like blasphemy, but I've always been more interested in hard to find content than product. That being said, I can't wait to get my hands on Faux Real. Faux Real features a bunch of up and coming indie bands playing songs by bands that don't really exist. For example, Sadie Dupuis of Speedy Ortiz covers "Pretend to Be Nice" by Josie & the Pussycats. I feel like this type of album already exists somewhere, but if it doesn't, it's about damn time. Another Western Mass band, Potty Mouth, covers "Take Me Away," which is apparently by a band called Pink Slip from Freaky Friday. The 2003 Lindsay Lohan version, so yes, this will make you feel old. But you also get Bent Shapes covering "Ow! My Face" by Mystik Spiral, Trent's band in Daria. The song even features the dialogue from the show that took place during the performance of the song. How has no one done this one yet? The song I'm most looking forward to is Field Mouse covering The Wonders, which could only possibly be "That Thing You Do." 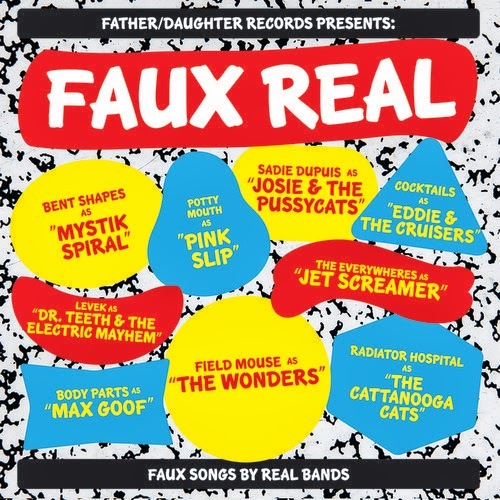 Faux Real will be put out by Father/Daughter Records on Record Store Day, April 19. Pretend you're buying the kids some Easter candy and get in line for this one.